Preteens are moving toward adolescence but no longer feeling like young children. They long to be treated as teens (or even young adults), but they still enjoy the games and silliness of childhood. Their minds and bodies are growing rapidly, and their emotions seem to be taking them on a roller coaster ride. So how do we help them grow in the knowledge of Jesus when they seem unpredictable, emotional, and overly dramatic one minute and serious, deep-thinking individuals the next? First, let preteens take on leadership roles during your Bible club programs. They can assist adult helpers, especially in your preschool and kindergarten areas. They can help with crafts, snacks, games, song time, and much more. They often thrive when given responsibility, as long as the expectations are clear. Provide strong leaders to help guide the preteens with specific directions and clear assignments. Don't give them time to just hang out with friends until the younger students have gone home for the day. Second, we can use a variety of methods in our teaching as we help the preteens focus on the lesson theme or Scripture passage. 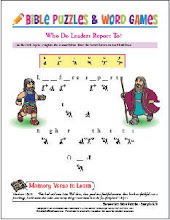 Object lessons, skits, pantomimes, stories, role-plays, worship and praise music, reader's theater, relays, art projects, games, quizzes, prayer, Bible reading, discussions, and many more teaching methods can be used to capture and hold their attention. Using more than one teaching method each week also gives us a chance to reach children of all learning styles and abilities. Transition times, moving from one activity to another, can be difficult for preteens, causing them to lose focus, begin talking about unrelated subjects, etc. For this reason, the teacher must be prepared to move quickly from one activity to the next. Planning ahead and going through the lesson the week before will help you to iron out any rough spots before you stand in front of your class. To keep your students focused on the topic at hand, clearly state your expectations before beginning a new activity. Let the kids know if it's okay to talk softly while they work or if you need their undivided attention. If you expect them to raise their hands before answering, tell them. Or, if it's okay for them to just call out answers, say so. If an activity will get your students up and moving, be sure to explain all the instructions before having them begin to move. Then ask for one of your preteens to restate the instructions. Clarify any of the rules, if necessary. Finally, ask if there are any questions. Have a student answer the question, whenever possible. If there are no more questions, you're ready to begin the game or activity. Provide a balance of active and quiet activities to help keep your students attentive, interested, and looking forward to the next activity. If your preteens begin to yawn or lose interest, quickly move on to your next activity or begin a discussion to recapture their interest. Your older students will appreciate having leadership roles such as handing out pencils, serving the snack, leading the prayer time, etc. But it's still up to you, the teacher, to let your students know what's expected of them for each activity. Explaining your expectations for appropriate behavior up front will help prevent many behavior problems before they start. Lighten up and be prepared to have fun. Now you can begin enjoying your preteens as the interesting, dynamic, creative creatures God intended them to be!